Nuclear particles called pions contribute significantly to the strong interaction. This force is responsible for binding nuclei together and accounts for most of the mass of the visible matter surrounding us. Now, for the first time, physicists have succeeded in precisely determining the deformability of pions. 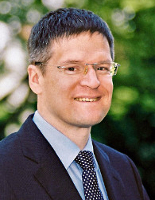 The result, to which researchers from the Technische Universität München (TUM) contributed considerably, is in close agreement with the theoretical predictions. It also revises earlier measurements that were incompatible with the standard model of physics. The experiment at CERN: The nickel target resides in the middle of the blue steel cylinder. 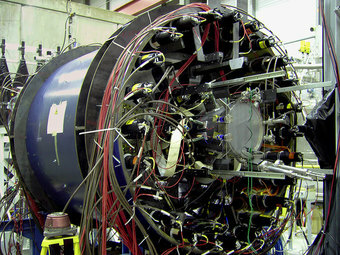 Four detector modules measure the deviation of the pions with highest precision. Everything we see in the universe is made up of tiny fundamental particles called quarks and leptons. The building blocks of the nuclei of elements, the protons and neutrons, are in turn made up of three quarks. For example, a gold nucleus consists of 79 protons and 118 neutrons. Darting between the protons and neutrons in a nucleus are pions, which mediate the strong force that binds the nucleus together. These pions comprise a quark and an antiquark, themselves tightly bound by the strong force. The extent to which these two constituents can be removed from each other is a direct measure of the strength of the binding force between them and thus of the strong interaction. To measure this deformability of the pions – physicists refer to it as polarizability – the COMPASS experiment shot a beam of pions at a nickel target. As the pions approach the nickel nuclei at an average distance of merely twice the radius of the particles themselves they experience the very strong electric field of the nickel nuclei, which causes them to deform and change their trajectory, emitting a light particle in the process. The researchers determined the polarizability by measuring this photon and the deflection of the pion for a large sample of 63,000 pions. 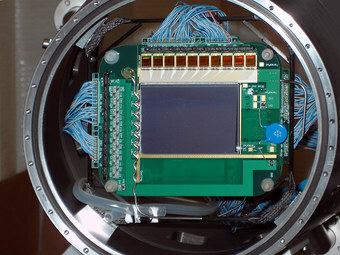 One of the experiment’s four detector modules – the module has been developed at TUM. It detects about 10,000 particles per second. 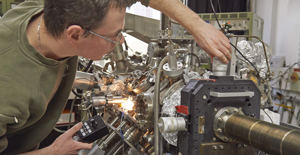 The COMPASS experiment has been running since 2002 at the Super Proton Synchrotron (SPS), the second largest accelerator at CERN. The collaboration includes about 220 physicists from 13 countries. 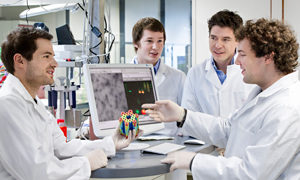 In Germany, the universities in Bielefeld, Bochum, Bonn, Erlangen-Nürnberg, Freiburg, Mainz and Munich are involved, as well as the Technische Universität München. In Germany the research was supported by the German Ministry for Education and Research (BMBF), the European Union’s research program FP7 and the German Research Foundation (DFG) via Cluster of Excellence Origin and Structure of the Universe.